Her classmate, Shawntia Reeves, attended four schools on the way to eighth grade. Or maybe five. Her parents weren’t sure of the details, beyond the fact that she’d started kindergarten at the small neighborhood school her family had attended for generations. When the district shut the school down to cut costs, she bounced around, forced to repeatedly make new friends, then lose them again. Both girls were members of the same eighth grade class at Bethune Elementary-Middle School in northwest Detroit last school year. They posed with their classmates for a photo in June — a portrait of middle-school grads who looked like they’d known each other for years. But the 31 eighth-graders in Bethune’s “8B” homeroom had collectively attended a total of 128 schools — an average of more than four schools each. Stories like theirs ripple through school districts across the country where the growing push to create new options such as magnet and charter schools has put an end to the days when most students enrolled in their neighborhood school. A comprehensive federal study that tracked a group of 20,000 children from 1998 until 2007 found that 1 in 8 had attended four or more schools by the eighth grade. Those students were concentrated in large urban areas where people living in poverty are also grappling with evictions, foreclosures, and other forces that push people from their homes. Here, decades of evictions, foreclosures and financial distress have ravaged communities and destabilized housing. Nearly 200 school closures have distanced families from what used to be neighborhood schools. And state policies engineered in part by Michigan philanthropist Betsy DeVos before she became U.S. education secretary have created one of the most robust systems of school choice in the nation. The effect: A recent analysis by two Wayne State University professors found that roughly 1 in 3 elementary school students changes schools every year — often in the middle of the school year. Bethune doesn’t have the highest rate of student churn in the city — it's fairly typical of district and charter schools in Detroit — but the long-struggling school housed in a stately red brick building sees new students arrive nearly every week of the school year, Woods said. And while Michigan schools aren’t held accountable for the scores of newly arriving students, once a student has stayed long enough for the exam to count, children who are frequent movers are the most likely to struggle. Many said they transferred because of changes to their living situations, such as moving to a new house or leaving mom’s place to go live with dad. 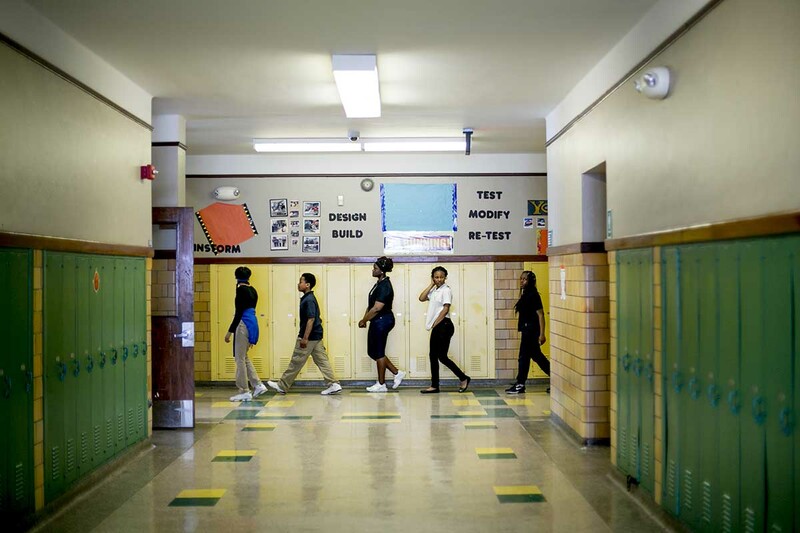 Lenhoff and Pogodzinski, the Wayne State professors, found that only about 55 percent of students in Detroit who changed schools between the 2014-15 and 2015-16 school years had also changed their address. The rest transferred for countless other reasons. Their schools might have closed, which is what happened to roughly 200 students last week when a Detroit charter school abruptly announced it was closing its doors just weeks into the school year. Students might have been expelled, or otherwise encouraged to leave a school. Their parents might have grown frustrated with a teacher or administrator. They might have received one of the fliers that routinely show up on Detroit doorsteps advertising suburban schools, and decided to take advantage of an offer of free bus transportation. A survey of 100 Detroit families conducted by Chalkbeat and the nonprofit news service Outlier Media found that one of the main reasons families changed schools in Detroit was because they were dissatisfied with the quality of instruction in their child’s school. It wasn’t until students were lining up at the door at the end of the class period that her new science teacher asked if she was visiting from another class. At Bethune, when parents report a new student has emotional issues, someone from the school’s “culture and climate team” typically meets with the new student to explain the school’s expectations and ease the transition, said Alisha Webster, who was the school's social worker last year. She had a few academic setbacks at Bethune, like a project she failed to finish for a science fair. After a fluctuation in her grades, she had to file an appeal to try to get into Cass Technical High School, one of the city's top high schools. But by the end of the year, she found a way to fit in at Bethune and was planning to enroll at Cass this fall. Detroit parent here. I'm not sure I understand the point of this article. If parents are frustrated that their kids aren't getting a good education in a certain school, yes - they're going to move. Unfortunately, they sometimes move a lot until they find the right school. But once they find a great school, they aren't going to move. You seem to be making the case that the problem is school choice. The problem isn't that we have school choice in Detroit - the problem is that we have too many bad schools in Detroit. I don't know where this series of stories is heading, but I have a feeling we're going to be reading your conclusions that we need to close all these charter schools and push everybody back into DPS, and then not let them leave. No, thank you. I found the point of the article to be that frequent mobility is a cause of low student performance (not the only cause) and, as a result overall school performance suffers. Hi, first, thanks for reading. This project was a major effort. The facts in the story explain that school choice has led to school shopping which hurts achievement. The more kids, move the worse scores get - and that's true of any school. A generation ago, before the current school culture, Detroit children attended neighborhood schools. If they were not up to par, parents demanded changes. Today, the parents simply move onto the next school. You are right, the problem is there are too many bad schools in Detroit. The schools parents move to in search of a better one are a pile of poor choices. DPSCD gets an F. Charters get a D-. And kids get to keep switching schools, with too few better than the next. That's what the data, scores, researchers, teachers, parents and kids all said. Thanks, again, for reading. The executive summary of the linked report on the ill effects of student mobility was far more informative than this entire article, which principally consists of repetitive examples of disrupted lives. Ms. Dawsey says, correctly, "The more kids, move the worse scores get - and that's true of any school. " But what are parent's alternatives? Are they to leave their children in F schools or search for one of the D schools? D schools are, after all, two levels up from the F schools. She says, " A generation ago, before the current school culture, Detroit children attended neighborhood schools. If they were not up to par, parents demanded changes. " Were they successful in obtaining the desired changes? Evidently not, because those parents have taken about half of Detroit's students out of those "neighborhood schools." It is no doubt true that " school choice has led to school shopping which hurts achievement." That argues for parents being given better information about different schools, not denying them the ability to choose. Minimizing the number of moves would yield a higher ratio of benefits to adverse consequences. Of course around half of the moves are due to the chaotic lives of many Detroit parents, rather than an attempt to improve their child's education. Chastity, you wrote: "A generation ago, before the current school culture, Detroit children attended neighborhood schools. If they were not up to par, parents demanded changes." So my fear is correct. Your conclusion is going to be that all of our kids need to go back to DPS and we need to close all the charters, because "all this choice is what drives down student achievement." Sorry, but I can't agree with your conclusion, and when you start taking away choice from Detroit parents, it's not going to go well. Contrary to popular belief, we're not too dumb to make good choices for our kids. The solution is to keep closing bad schools (which the charters are doing, but DPS is not), and keep opening good schools. The charters need to get their act together and close those bad schools at a faster rate. DPS needs to finally step up to the plate and close at least ONE school for academic reasons. They've closed a lot of schools, but never because of poor academics. Your conclusion is that we need to take choice away from parents. Your conclusion SHOULD be that we need to make sure parents only have good choices. Chastity, you say that charters are only marginally better than DPS. I saw that the top 10 schools in Detroit when it comes to SAT scores are all charter schools. That doesn't sound "marginally" to me. As you can tell, this story shares facts from research about Detroit schools. The only conclusions are the ones set forth by statistics, test scores and research. Readers, parents and voters can draw your own conclusions about what this means for your community or what should happen. Also, the top 10 Detroit schools for SAT are not charter schools. DPSCD still has Cass and Renaissance that continue to out perform high schools in Detroit. Cass and Renaissance require exams and applications for entry. Also note that DPSCD high schools must accept all resident students, while charter schools do not. Again, it is up to you and your community to decide whether to do anything with or about the mobility and achievement information. Good luck! These parents all, and always, know better than the elite educational establishment what is best for their children. Thank God they have the ability to act on that knowledge, taking full advantage of the myriad choices available instead of being held captive by an unresponsive local district that treats them as chattel. Ingrid Jacques told me so. But in the end, it appears that the vast knowledge that parents display for their children apparently doesn't translate to high student performance in schools, charter or public. Why is that? Hi, thanks for reading. The data show that parents know they are looking for better schools. And among the myriad choices they are clearly not finding any better choices than the schools in the public school district. The more students change schools looking for a better one, the worse they perform in school. DPSCD schools perform worst in the U.S on the NAEP and very poorly on the M-STEP. After 20 years, the charters are performing slightly better. That's not saying much. Also, please understand the racially sensitive nature of the word "chattel" when it comes to African Americans. I'm pretty sure the schools do not treat children the same as children were treated during slavery. I'm pretty sure John's comment was meant to be satire, hence the last sentence.